"Before June 21, Ramtha hospital was very busy. The hospital was crowded with war wounded patients, the border was open and severely injured people were being evacuated to our programme." 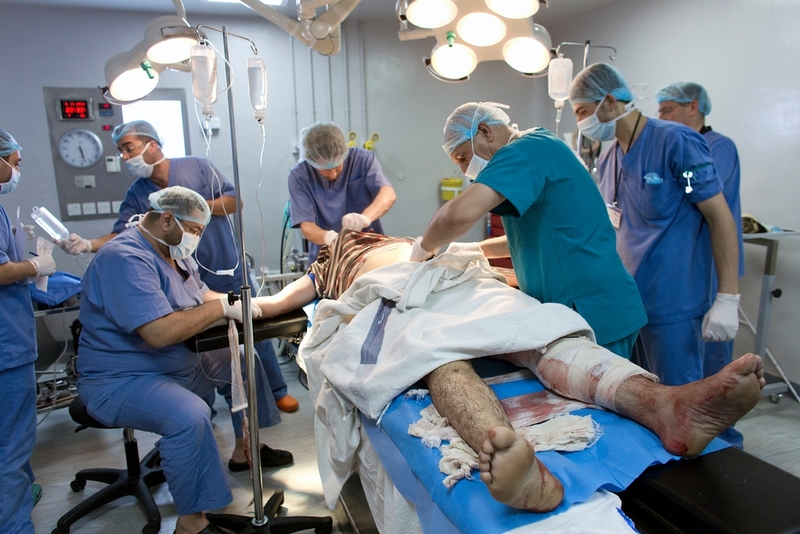 Hardik Vyas, otherwise known as “Tonny”, is a surgeon at MSF’s Ramtha surgical project, northern Jordan. Here, he gives his account of life in Ramtha Hospital since the border closed. We were seeing patients in the emergency room and you ended your working day with mixed feelings, sad that people are still being harmed in the ongoing conflict in neighboring Syria, yet relieved and happy that you were able to save a life or two. "We were receiving life-threatening cases, such as multiple fractures, abdominal, chest and trauma injuries, as well as cold cases that require long-term management. All the cases that are referred to Jordan are complex. Some of these cases, if previously treated, were not well-managed, as hospitals in south Syria lack the medical infrastructure and capacities that Jordan can offer. " "We often have to perform surgeries all over again to ensure that the patient receives adequate medical care. Today our programme still stands, but rooms are half empty and the emergency room is silent." However, five kilometres from Ramtha hospital and just across the border, the sound of explosions and bombings is deafening. Doctors, surgeons and nurses are ready to treat patients but unfortunately we are in a state of hibernation right now. We feel paralysed, but every bomb that goes off on the other side of the border shakes us to the core. We hear the sounds of bombing daily, and the ground shakes beneath our feet. If this is the situation over here, we cannot begin to imagine how horrifying the situation is across the border in Syria. The minute you hear the sound of nearby bombing, you feel helpless and restricted. You are so close, yet so very far because you are unable to reach those in need. We cannot provide assistance, regardless of our eagerness to do so. The information we receive about war-wounded arriving at the border but not being allowed to cross, when there is a fully equipped hospital running at maximum capacity to treat them just a few kilometres away, fills us with despair. Now, when I think about the patients that are being denied permission to cross into Jordan, I think about the kind of treatment they are receiving inside. We do not know how many lives are being lost because of this horrible situation. The field hospitals in southern Syria must be overstretched - on some days, they receive a massive influx of casualties of about 50 wounded in one hour and they have to attend to 10 patients with immediate intervention. They must act fast to save limbs and lives. We were able to help them cope with these numbers of wounded in the past, but all we can do now is wait, and this is where the frustration lies. I heard about a 10-year-old boy that arrived to the Jordanian border with a severe head injury about two months ago. The wounded boy was turned away at the border and his family had to take him to a facility in Damascus for treatment, as hospitals in the south of Syria lack the capacity to treat complex trauma injuries. However, despite all efforts to save him, the boy died. If only he had made it to our trauma surgery hospital, maybe there would have been at least a possibility for him to still be alive today. I keep thinking, “if only”.